It was my first time booking a house through VRBO. The BBQ utensils in the kitchen were dirty. The blender did not work until a day later. All the pans and pots were old and needed to be replaced. The driveway was not clean of snow, and we had to clear it out. It was a very difficult task, and my brother got injured cleaning it. It is a spacious house, but the kitchen and driveway issues were a downer. Furthermore, make sure you read all the information before booking to avoid extra charges. These issues were not brought to our attention. If we did, we would have housekeeping return to provide additional cleaning to our 5 bedroom home and addressed your complaints. We have an excellent automatic snowplowing service. If the driveway is not cleared to your satisfaction, a call to the snowplowing service would bring them back for driveway clearing. We have a large parking area for 5-7 cars. It was also an epic snow weekend where it was snowing constantly. We provide a large inventory of pots / pans / utensils, both new and old. Some of the older pots are sturdier, so we keep them around. We constantly ask that if there are issues upon arrival, to contact us right away so we can address them. We are sorry that you were not satisfied with your stay and advice to contact management right away so we can address any issues. We strive to provide an enjoyable experience in Tahoe. Excellent value! Clean and comfortable. Common rooms are older-Tahoe style (e.g., darker wood), and bathrooms are updated to current styles. Well-stocked kitchen, ample parking for 3 cars (driveway plowed in winter), great heater, big TV, big dining table, and really nice fireplace. Ample number of beds for large groups / multiple families. Short walk to Lake Tahoe (about 2 blocks). We were on a ski vacation between Xmas and New Years: 1/2 hour drive to Squaw or Alpine in the morning, longer (1 hour?) return in the afternoon due to traffic on Hwy 89 and in Tahoe City. I expect Northstar is a shorter drive as it is closer. Thank you for your kind review. We continue planning updates to our home, while maintaining the older-Tahoe style architecture. We welcome your suggestions to improve our property. We have a large, flat parking lot that can accommodate 5 cars during winter and 7 cars during summer. Good stay for the price. My kids loved the community center and pool. The house brought me back to the 70s! Clean and comfortable. We maintained the old Tahoe style, but modernized the bathroom facilities. 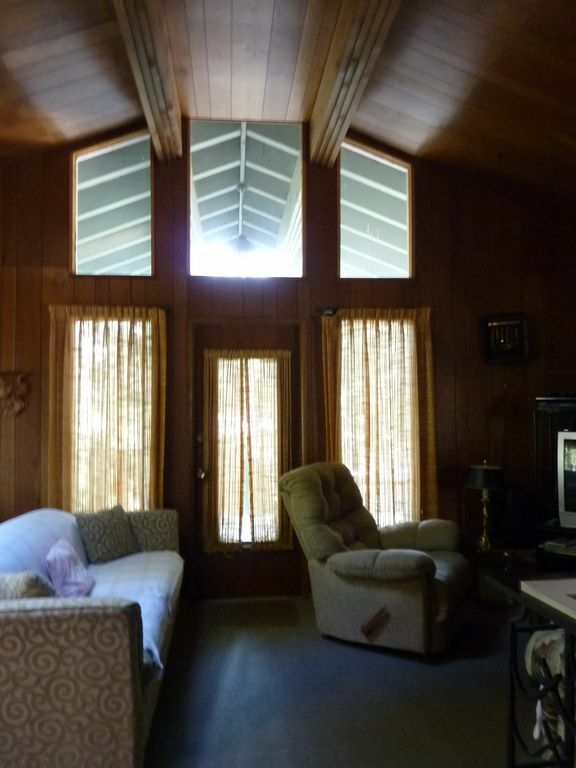 If you're visiting N. Tahoe, this spacious cabin is right where you want to be. We drove about 8 minutes one afternoon to do zip line, 15 minutes one morning to do rafting (and that's with a little traffic), and maybe about 5 minutes to the beach to spend one afternoon (a friend even just ran to the beach to meet us as his exercise for the day). There was also fireworks that's on 7/3 on the town's little beach, Safeway isn't too far away, and if you enjoy the crowd, drive for less than 10 minutes and you'll get to King's Beach. The owner of the property is so nice and understanding. Since it was my first time booking on VRBO, she took time introducing herself and making sure I was comfortable enough in the beginning of the transaction. She explained everything very clear and she sent all the info and key etc on time too. Very responsive over emails and there was no need for calls. Overall, very happy with the stay and will def come back! 5 Bedroom Home in a quiet forest setting. Casino, Sliding, Cycling, River Rafting, Ski, Golf, Snowboard, Snowmobile, Restaurants, 24 hour Safeway-Grocery Stores. Agate Bay, Carnelian Bay. Near Kings Beach, Brockway, Tahoe Vista, Tahoe City. Seasonal dates are estimated. Rates are subject to change. Ask for Holiday Rates via email. Certain Holidays have 3 to 5 night minimum. A $400 security deposit is required. A county tax of 10% is required. Cleaning fee is $200. No Smoking. Pets considered for additional fee. Rates are subject to change. Low Season: May to before Memorial Day and from September to before Thanksgiving. High Season Summer rates: $1,800/week or $300 per night. Summer weeks are from Saturday to Saturday. 2 night minimum. Holidays with 3 to 5 night minimum: Thanksgiving, Christmas, New Year, MLK, President's Day - Ask for Holiday Rates. Inquire about the Tahoe 3 bedroom 2.5 modern home from $150 to $190 non-holiday nightly rate. Inquire about available discounts.